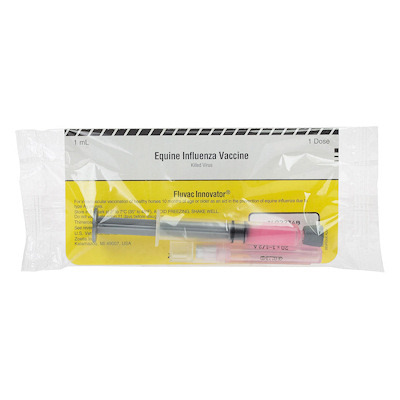 Fluvac Innovator (Zoetis) single dose vaccine protects against Influenza strains A1 and A2, also protects against the Prague 56 and Kentucky 92 flu strains. Flu only. No Rhino in this vaccine. This vaccine contains Metastim sdjuvant that enhances immune response for rapid immunity and disease protection. Inject 1ml IM and repeat 2 to 4 weeks later, Annual revaccination is required.